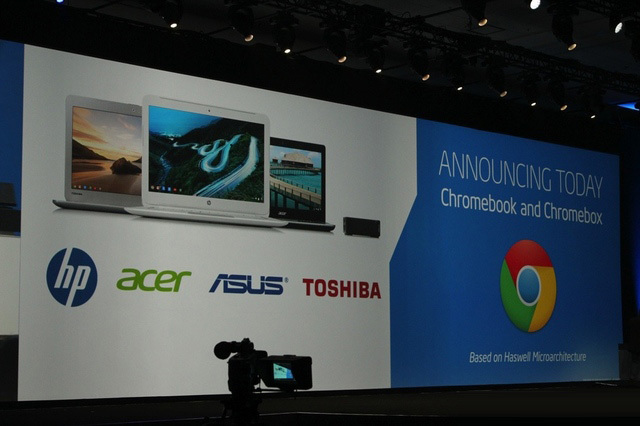 Google has announced the addition of two new Chrome OS partners in the form of Asus and Toshiba. Both of them will be releasing their Chrome OS devices in the coming months. Along with the new partners Google has also brought to light that existing partners like Acer and HP will be launching new Chromebooks too. The company also said that all if these Chrome OS devices will be powered by Intel’s new 4th gen core processors (Haswell). Google also opines that while HP, Toshiba and Acer will be launching new Chromebooks, Asus will actually be releasing a Chromebox. However, the details on these new Chrome OS devices are not out yet. But Google did say that HP’s new Chromebook will pack a 14-inch display and will be available in multiple color choices. Toshiba and Acer on the other hand, will be focussing more on portability rather than big display. Intel has also said that the new Haswell powered Chrome OS devices will offer 15 per cent more battery life and 50 per cent performance jump over their Atom-based predecessors. Well, this is pretty much it and no other details are available about the new Chrome OS devices as of now.